Bimal Gurung today said he would quit the Gorkhaland Territorial Administration "in the next two to two-and-a-half months" and start an agitation for a separate state of Gorkhaland, somewhat stunning other leaders in the Gorkha Janmukti Morcha. During the last phase of the Gorkhaland movement in 2013, Gurung had resigned as the chief executive of the hill body on July 30 but again assumed office on December 26 the same year. Gurung today made the announcement at a news conference in his office at the Gorkha Rangamanch Bhavan. He said he had consulted neither Morcha central committee members, nor elected GTA Sabha members regarding his decision. Gurung said: "After a few months, I will resign from the GTA and will take up the issue of the separate state of Gorkhaland." During the interaction, he repeatedly said he would resign "in the next two to two-and-a-half months". "I would need around two to two-and-a-half-months as I have to finish some work (in the GTA). 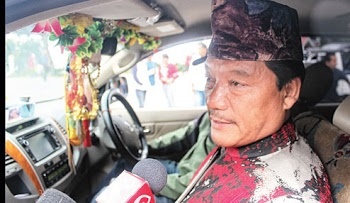 I have to ensure that people are not inconvenienced," Gurung said. The hills' biggest political party, the Morcha, has watched with unease as Trinamul has tried to carve out a foothold in the region. In the last Assembly elections, although the Morcha won all the hill seats, its victory margins were vastly reduced. Gurung today said if other elected GTA Sabha members wanted to run the GTA, they were free to do so. Asked about the kind of agitation he had in mind, the Morcha president said: "The type of agitation, its form, everything will be known as and when it is decided." Gurung had repeatedly been saying at almost every public meeting that he was not interested in any position. "If I was bothered about the GTA chair, I could have developed a very close relation with the state government and lived comfortably," Gurung said today. On September 10, 2015, Gurung had threatened to resign as the GTA chief executive "within 10 minutes" of the under-construction Rama Krishna Siksha Parishad Higher Secondary School, opposite the Darjeeling Raj Bhavan, being demolished. The district administration had said the school's re-construction would pose a threat to the governor's hill residence. The administration said the top two floors should be demolished. Later, the administration allowed the construction but with modifications. The Morcha chief today made it clear that his decision to go ahead with the agitation was largely because of the state government's alleged interference in the functioning of the hill body. "I think the decision to accept the GTA was wrong.. I am not crazy for chair or the GTA," said Gurung. "We had accepted the GTA with the hope that we could administer the hills and learn governance that would help us when Gorkhaland was formed. However, there has been constant interference in the working of the hill body. I have raised the issue with the state government, even with Miss Mamata Banerjee during our one-to-one interaction and also with the Centre, not once but many times," said Gurung. "The state government has instead divided the hill communities and are making us weak from within so that the demand of Gorkhaland fades away. But I cannot let this happen," said Gurung. The Morcha president urged the hills to be ready for a "decisive battle". Gurung said he was not sure whether municipality elections could be held in the hills. "The situation in the hills might be such that it might not be possible to hold municipality elections," said Gurung. The term of the four urban bodies in Darjeeling, Kalimpong, Kurseong and Mirik will end in November. Other than Gurung, no Morcha leader was present at the press conference. Sources said he had asked senior Morcha leaders not to be present in his office during the press conference. Most of the senior Morcha leaders were taken by surprise by Gurung's announcement. "I was taken aback by his decision. We are still hopeful that the GTA would finish its term in July next year," said a Morcha leader who didn't want to be named. Addressing a public meeting in Darjeeling on August 7, Gurung had urged the hill youths to talk their heart out, making an indirect reference to an agitation.